(Area: NN 023 613) Clach-a-charra, a standing stone at Onich, near Balahulish,is nearly 7ft high and is perforated with two circular holes. It is traditionally associated with the slaughter of the two sons of Cummin of Inverlochy, in revenge for wrongs perpetrated on the bride of one of his vassals (Vernen 1911). J J Vernon 1911; J Drummond 1868. 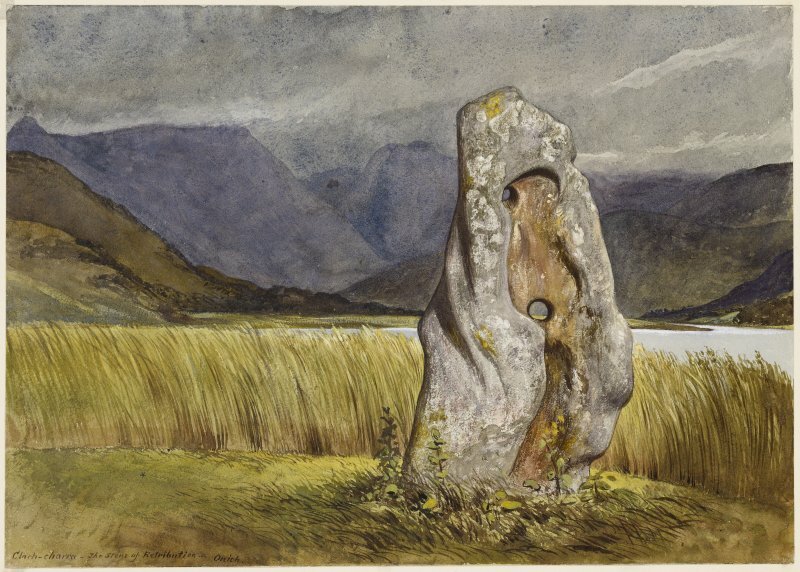 Clach-a-Charra (name confirmed), a standing stone at NN 0256 6134, is as depicted by Drummond and measures c.2.2m high by c.1.1m wide by c.0.2m thick. A complete fracture, c.0.3m above the base, has been repaired. The holes appear to be natural. Visited by OS (R L) 6 May 1970.